Semimaru was a blind poet and musician who served the son of Emperor Uda. He was both an historical character and the protagonist in a nō play, 'Semimaru'. When the prince died in 966 he moved to live in the mountains near Kyoto. 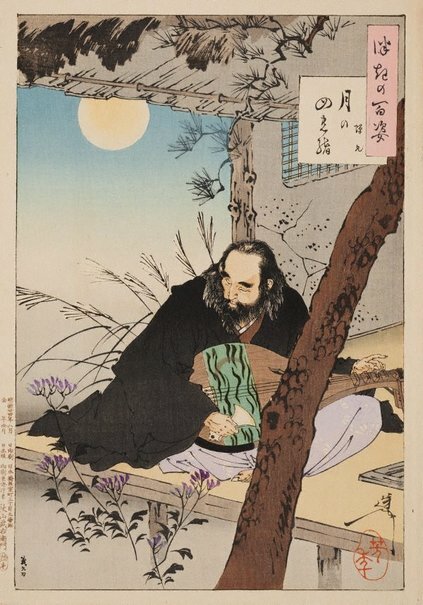 Here, he is in a remote dilapidated house, playing a 'biwa' (Japanese lute), which has a design of a crescent moon on it. He is surrounded by wild grasses, and in the foreground are the autumn blossoms of beautiful flowers. Ironically, Semimaru cannot not see the beauty of the moon or his poverty stricken surroundings, and all he has left is the splendour of his music.